Mollificence | malificence, n. 1. mischief. My favorite parts of the class were all the observing assignments where we went to real locations (library or otherwise). I really loved reading everyone else’s service safaris in particular, and seeing the range of services we investigated. It was interesting to see what small steps you could take to shift your thinking and allow you to see things with fresh eyes. Because I have a background in technical writing and editing, the website and writing topics felt more familiar, although I did plenty of new stuff in those areas as well. The real life assignments were the ones that got me out of my comfort zone, however. I was especially glad to read the Nondesigner’s Design Book and learn about the visual aspects of design. I always thought of myself as very verbal and assumed visual design was not one of my skills. That book made basic visual competency look accessible. I may not set the design world on fire but now I feel like I can critique design and improve it. One of the things that surprised me about the class was how often the issues of the broader culture and inequities came up, and how integral that is to user experience. I started the class thinking in terms of websites, library policies, etc. But once you start emphasizing the human aspect and empathy for library members, the whole world gets invited in to the library–which means that the whole world of issues come into the library. This came up in the assignments, for example when we watched the video about the Alley Health Fair from the Vancouver Public Library (BCLibraries, 2012). It came up when I observed at the Hayward Public Library, noticing how the surrounding economic realities affected the library was inescapable as part of the observation, as well as seeing how libraries try to balance the needs of different groups in a compassionate way. We can’t sit tight in our little safe libraries, do what we’ve always done, and ignore the needs around us. As Rodger wrote, libraries are a part of greater host systems, systems that we need to give back to (Rodger, 2007). As the world around the library changes, so must we, because our surroundings are changing. Of course it’s common for librarians to say that we are part of our communities, we value them, we love them, and so on. One of the great things about this class was being given specific, measurable things to help reach the goal of improved user experience and greater user engagement. Specific tools of design and web writing principles, and simple exercises like service safaris and contextual inquiry provide the entry for empathy to occur, opening up the library experience and allowing us the space to invite our communities in. I thank everyone for a wonderful semester! Rodger, E.J. (2007). What’s a library worth? American Libraries: September 2007, 59-60. I volunteer in the school library at the middle school. We collect only very simple metrics on circulation and on textbook records (the librarian checks textbooks and class-assigned novels in and out also), basically ones that come from the (unimpressive) circulation system. Most of the school libraries in our district have pretty static library services (and budgets–with the occasional panic over whether they will cut the librarian’s job or hours). Since increased funding is a pipe dream, no one really thinks too much about innovation, which is too bad, since for many of the students, the library is a lifeline, and I think it could be that for more kids with some innovative thought. Some innovations don’t need to be expensive. The dull statistics we do collect could probably be used to tell more about user experience than they do. From the circulation statistics, the popularity of books could tell us a lot (and the library is small enough that even a manual review could be useful). The books that there are a lot of hold requests for, or renewal requests for, or overdue slips for–that could be very useful information, especially if it could be linked to some sort of genre information (which is often not included in basic cataloging information). Adding some sort of genre tagging could allow for some automated information about what genres as popular, or what’s waxing hot or not over time. Knowing class assignments and then seeing what books turn to for those assignments could tell us about students’ level of information literacy and what they find interesting. Even the textbook statistics could tell us something: students who lose or damage textbooks or library books may be students with a more chaotic home life. Keeping track of these students and reaching out to them or reporting to the counseling department could raise kids to the radar who need extra support. Lankes writes, “A good librarian challenges what could be, not simply reifies what is” (Lankes, 2013). There is a tremendous library knowledge gap among school students–the students who regularly use the library often learned library skills from families, having been taken often to public libraries. Other kids who don’t use it just think of it as a place you have to be quiet and are unaware of the library’s potential for self-chosen learning. Both school and public libraries have a mission to challenge that. The kids who aren’t even aware of what the library offers are probably the ones who need it most. As Morville points out, “The story of the library was rags to riches, not the rich get richer” (Morville, January 16, 2013).Our mission is to address information inequality and to offer library skills to underserved groups. In trying to close the library skills gap, school libraries have one advantage over public libraries: they know exactly who all their potential users are, down to a complete list of names. Tracking who uses the library and who doesn’t could help you reach out to potential users and make them active users. The Library innovation and the community video (BCLibraries, 2012) about the Alley Health Fair made me think how a school library could get “out of their comfort zone” and reach out to students where they are. Already, the librarian will visit a class that is studying Egypt with a cart of books. But what about visiting the basketball courts (and the kids who use their every free minute to play) with books about sports? The school garden with books about the natural world? School clubs could be visited with a topically appropriate book cart. Our school also has “mandatorial” periods where students who need it get extra help. Perhaps the librarian could visit mandatorial sessions with books that support common issues that students are struggling with. What about a roving librarian with a laptop on the school wireless network to help students in mandatorials (or some other school situation) with research? Collecting information about what students want to know is more important than knowing how many books they check out. Another strength that school libraries have that classrooms don’t is that library learning can be serendipitous, rather than mandated by the Common Core (or whatever the state secretary of education bought into this year). Learning can be “self-paced and student centered (Morville, August 25, 2013). In a blog post last April I explored the subject of serendipitous learning, a great strength of the library: “Libraries have always been places for self-chosen learning; it’s a history that can be built on in helping with a transformation of learning for the future” (McKinney, April 20, 2014). Learning can be driven mainly by the interest of the student. Instead of just accepting what we have always done, we can listen and learn and then teach. I do not currently work in a library so I decided to go back to my public library Contextual Inquiry for some inspiration for my new service memo. On my contextual inquiry trip I noticed a few pain points. I decided to select one of medium difficulty and imagine coming up with a solution for it. This memo is informed by my contextual inquiry trip but with a lot of hypothetical thrown in. As you are aware, the configuration of our Laptop/Wifi Area has presented some pain points for our library members. The existing large tables work well for groups, but in practice, the majority of our daytime users are individuals with their own devices. During late afternoon (after school) and evening hours, more groups utilize the tables, but there is still wasted space. Our team has developed a proposal for redesign of the area that would improve our members’ experience of our library. Using the IDEO process (Moen, 2001) our UX team has investigated the space, brainstormed, tested out a small prototype of a redesign, solicited library member feedback and drawn conclusions on what we believe to be a new design that will delight our library members. With your approval, we would like to implement the final recommendations outlined in Step 5 of this memo. Team members spent several days at different library times observing how the Laptop/Wifi area is actually used. Currently the space consists of several large rectangular tables that seat about 6 people, with chairs. Also in this area are computer carrels with dividers, holding 8 total dedicated desktop computers that can be used by library members. There is no soft seating in this area. There is some soft seating in the nearby stacks area. After observing and recording, the user experience team gathered to analyze our observations and understand what is going on in the Laptop/Wifi space. We wrote observations on sticky notes so that we could sort them and see patterns. The major category that struck us was the fact that space is wasted by the inflexibility of the furniture. Another observation is that people make adaptations to the space (examples of this were moving keyboards to one side of the computer carrels so that they could use their own devices, or sitting on the carpet against the wall rather than asking to share a table already occupied by another user.) Also, patterns of use are different at different times of day. Unsurprisingly the teen space sees almost no use during school hours, and heavy use once schools get out for the day. We then spent a couple of weeks observing the effects of these changes, as well as soliciting library member feedback. Most feedback was positive but we did discover one of our ideas that didn’t really work out. The flexible modular table was very popular and allowed members to adapt the space to prevailing usage pattern during the time slot. The teen space/group space experiment did not work well. Occasionally we faced the prospect of asking adults to leave so teens could use the space. Teens reported discomfort at having their dedicated space taken away. Space that is “theirs” is very important to teen library members, more so than to adult members. With your approval, we look forward to delighting our members with our new and adaptable Laptop/Wifi space! Thank you for your interest in Mollificent User Experience Consulting. I am happy to provide you with more information about what our firm can do for your library! Here is a brief overview of the UX audit process. Libraries work hard to maintain relevance in today’s digital world. Library members turn to libraries for a positive experience, but it is possible for us to lose focus on our mission and fail to provide that delightful experience. Libraries need to give back value to the larger host systems of which they are a part (Rodger, 2007). In Subject to Change: Creating Great Products and Services for an Uncertain World, the authors write about creating the “long Wow!”–creating an experience that “delights, anticipates the needs of, or pleasantly surprises the customer” (Merholz, Verba and Wilkens, 2008, p. 131). We anticipate the needs of library members when we make necessary tasks, such as paying fines or placing holds, easy and convenient. We also can surprise and delight members with services that add value to their lives. Additionally, since the mission of the public library is to provide access for all, a focus on user experience improves the equity of information and is a social justice issue (Harihareswara, 2015). To assess the library, we follow a three phase process of getting staff involved, doing research to get to know your users, and assessing the library to get to know your own library with fresh eyes. Everyone in the library should be involved with a user experience audit. If this is not feasible, a representative UX team should be selected, allowing all stakeholding groups meaningful participation in the process. Knowledgeable input from staff helps set the right goals for the audit and staff buy-in will make the UX audit a beneficial and successful project for your library. We will meet with staff members and set the goals for this project. To get staff into the UX mindset, we encourage them to participate in service safaris to other libraries or other types of service providers, doing a task as simple as ordering a cup of coffee or picking up drycleaning, while taking notes about the experience and how it goes well or falls short. This simple and fun activity helps open your eyes to user experience, an awareness that staff can then apply to their own library. (Schmidt, March 5, 2012). User research to understand what your library members need and want from your library is the next important step in the UX audit. To get a general picture, we use traditional methods of information gathering, such as community surveys and collecting demographic information, but we also encourage more qualitative information-gathering to get some depth of information. These traditional methods of information gathering help provide a big picture of library members, after which we can investigate in more detail with some in-depth user research methods. Even a few interviews with library members can provide a wealth of information that surveys and demographics miss. In user interviews we seek to drill down to get rich insight into members’ goals (Schmidt, January 18, 2012). After surveys and interviews, we develop fictional representative personas of library members that will help guide our planning for user experience (Schmidt (2012, October 3). Members of the UX will spend time in the library observing how patrons accomplish common tasks, and note any pitfalls. After observing and taking notes, we brainstorm potential solutions for any obstacles (Schmidt, 2011, June 1). Once the UX team has developed a sense of your library members’ goals, we turn our attention to assessing the library and how well it meets them. We assess both the library’s web presence and the physical library and how it facilitates library member tasks. Reviewing the pages of your library website provides a big picture assessment of the usability of the site. A content audit also helps in the later process of prioritizing changes, since a content audit spreadsheet can be manipulated to see patterns (Detzi, 2012). Journey maps are flow charts that outline how members accomplish principal tasks at your library. By noting every step in a given task (such as reserving a meeting room), we can uncover obstacles that get in the way of a superior user experience (Churruca, 2013, March 17). Libraries need to convey a great deal of information about programs, services and policies. Sometimes in the rush to get as much useful information out there as we can, our signage becomes overwhelming, or fails to convey the tone we wish it would. By examining the library signage we regain control of the message we convey and improve the comprehensibility of signage (Schmidt, 2011, February 1). After we have gone through these steps and made a thorough assessment of your members and your library, our team will work with your staff to prioritize issues and propose solutions within the framework of your available resources. We are experienced at helping libraries get the biggest return on change efforts and can help you chart a long term plan for being responsive to user experience as well. Please let me know if you have any further questions and I will be happy to answer them. We look forward to working with your library. Merholz, P., Schauer, B., Verba, D. & Wilkens, T. (2008). Subject to Change: Creating Great Products and Services for an Uncertain World. Sebastopol, CA: O’Reilly. I went to the Castro Valley Library to find my signs. I found two to work with, an informational one advertising the library’s online Mango Languages resource, and another sign that was a combination of directional and informational, announcing the location of the free tax help service in the library. 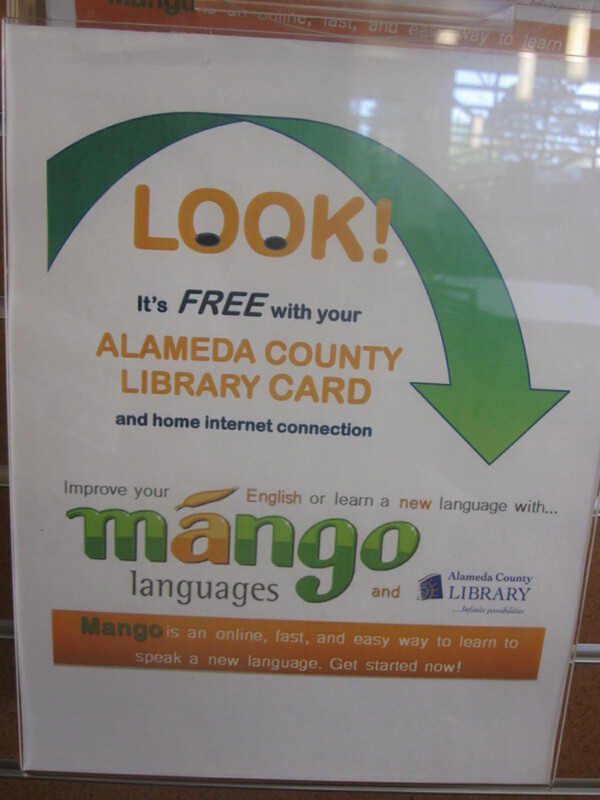 This sign advertises the Mango Languages online language learning tool that is available to library members. The orange and green color scheme has a pleasant, sunny effect, and makes sense with the service name, Mango. The Mango logo is pretty. However, there are a lot of problems. Sounds great! Get started how? The purple and gold Alameda County library logo doesn’t match with the orange and green Mango branding all that well. It’s understandable they want the library branding on there too, but it really adds clutter. I imagine this is a common problem when libraries have branded services (Mango, Overdrive, Zinio, etc.) but they also want to include library branding so people realize it is a library service and not an advertisement. There is use of ALL CAPS to try to provide emphasis. The alignment is a mix of centered and left-justified which causes your eye to jump around a lot. The huge arrow makes your eyes jump around even more and yet it doesn’t point to a important feature or piece of information, so it isn’t helpful. This sign makes you work too hard to figure out what the sign is about. I decided the most important information for the sign was that the library has an online language learning tool for members, and I tried to create a sign that conveyed that more quickly and clearly. I found some other Mango collateral on the web and found the image of the woman “picking up” a language and decided to use that. I think this sign is more clear about the two main questions a viewer would have: What is this about and how can I use it? The graphic reinforces the fact that this is a language tool (unlike the arrow, which was just….a big arrow). I removed the library branding to reduce clutter–I think most people remember which library they’re in. I also wanted to add a nice orange color gradient that matched the Mango logo (light orange fading to white at the bottom). This turned out to be a big hassle because the woman’s blouse is white and so making the area around her transparent without turning her blouse orange in patchy spots was very difficult. I gave this up. The second sign I chose was mainly directional but also had an informational aspect to it. 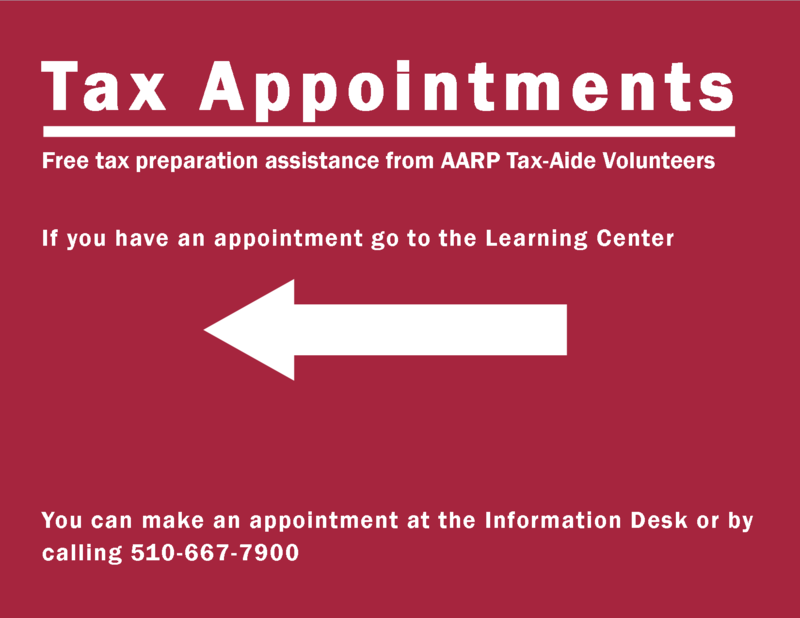 The library has volunteers offering tax help by appointment. This sign just inside the front door indicates where you should go if you have an appointment. Once again, the dreaded center alignment and ALL CAPS. Also the “by appointment only” seems a bit stern, I wondered if there was a way to convey the same information with a more positive tone. Also, unless I already have a tax appointment and know what this service is, I am likely to misinterpret this sign. I asked my husband what he thought this sign was for and he said “tax help for seniors.” That’s what I thought too. 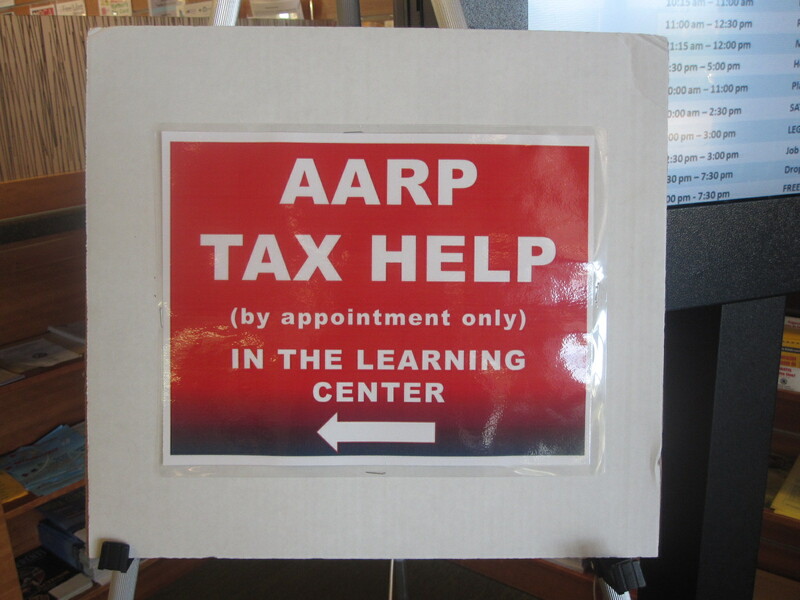 Actually “AARP tax help” refers to volunteer Tax-Aides from AARP. The service is available to anyone of any age who wishes to use it. 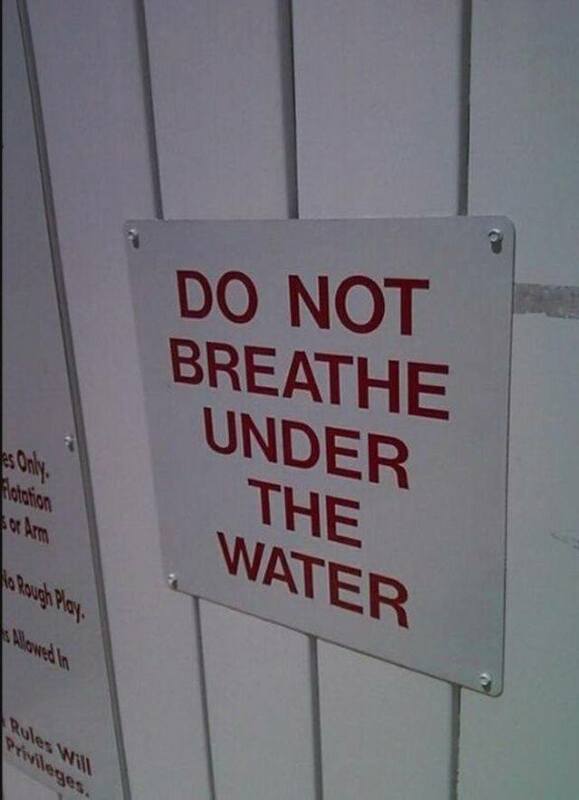 In this case, the sign has too little information, since it is so vivid it will catch most people’s attention as they come in, but only those already in the know will understand it. I tried to make adjustments so that it served the primary directional purpose but also provided sufficient information to people whose interest was piqued by the idea of tax help. Williams, R. (2004). The non-designers design book. Berkeley, CA: Peachpit Press. Using a hammer should be easy because the goal is to drive a nail, not figure out how to use a hammer. People turn to libraries sometimes for fun goals, sometimes for serious goals. Sometimes they seek community, sometimes knowledge. One thing that is common across all of these goals is that people are focused on their goals and not on library procedures. To the extent libraries can “get out of the way” and provide a seamless experience, we can serve our members better. As the quote above illustrates, people don’t pick up a hammer and want to spend time learning how to use it: they want to drive a nail. Neither do they think, “oh goody, a chance to learn a new database interface.” Especially now that search engines like Google provide a very simple interface, people are impatient with a lot of “interface” getting in between them and what they want. Complex interfaces, borrowing policies or card eligibility that is hard to find out and/or hard to understand all can “get in the way.” Library members don’t want to be “made to think,” at least not until they have found the content or program that they desired in the first place (Krug, 2006). User research is a critical way to find out what is “in the way” of library members. It is easy enough to say we need to get out of the way, but hard to put ourselves in members’ shoes in order to see what is in their way. We may take for granted knowing borrowing card eligibility rules, or that the local weekly paper prints a list of our programs but our website doesn’t, or how to use the OPAC or what the procedure is for requesting a meeting room. Something else common to most libraries is the fact that the actual users are often a subset of the potential users. Teoh mentions the importance of interviewing non-users to find out what could convert them into actual users (Teoh, 2014?). Reaching out to people who are underserved is a critical part of fulfilling the library mission, and in-depth research like interviews can help any library will uncover hidden obstacles. Krug, S. (2006). Don’t Make Me Think: A Common Sense Approach to Web Usability. Berkeley, CA: New Riders Publishing.